US: Woman arrested by Houston police for aiming laser pointer at helicopter | Laser Pointer Safety - News of aviation-related incidents, arrests, etc. 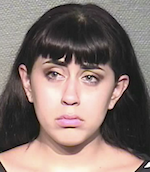 A 23-year-old Corpus Christi, Texas woman was arrested July 10 2016 for aiming a laser pointer at a helicopter flying in a low-income area of Houston. The helicopter was lased twice while in the air, and a third time when it landed. Officers traced the laser to Emily Ann Hunter. She was charged with illumination of an aircraft, a misdemeanor. Bond was set at $1,000.